“The old lie: dulce et decorum est pro patria mori” – It is sweet and honourable to die for ones country. This is how Wilfred Owen summed up the attitude of a generation sent to war under the illusion that it would be a short and glorious conflict. Owen himself was one of the last killed in a war that saw an estimated 40 million soldiers and civilians die as a bloody stalemate ensued over four years. Both sides only ever managed to advance of couple of kilometres against their respective enemies. All the key protagonists lied to workers, claiming benign motives. Britain and France claimed they were opposing “German militarism” and defending “poor little Belgium”. Likewise, Germany claimed it was waging a war in “defence of the fatherland”. In Ireland, Unionist and Nationalist leaders both acted as recruiting sergeants for the British government, claiming that helping in this was effort would assist in their competing aspirations. The real reason behind the war was that, in the age of imperialism, capitalist powers clashed and vied for control of the world market and for the profits that could be reaped from the exploitation of people and resources. In February 1917, Russian workers overthrew the Tsar and, eight months later, took power themselves. They were led by the Bolsheviks, who won a majority in the soviets, the workers’ councils which brought elected representatives of millions of workers together. The first workers’ government appealed to the peoples of the world to make common cause in a struggle against capitalism. They ended Russian involvement in the First World War. By October 1918, the German high command had handed power to a parliament in order to negotiate a truce as a result of successive military defeats. When admirals decided to launch a ‘death ride’, a completely hopeless assault on the British navy, sailors in Kiel organised to prevent the ships from leaving port. Their commanders responded by jailing more than 1,000 sailors. A mass movement was organised, led by women in the town, to defend the sailors. The workers of Kiel and nearby cities rose and then the soldiers sent in to put down the revolt ended up joining it. On 3rd November, officers opened fire on an unarmed demonstration, killing eight protestors. 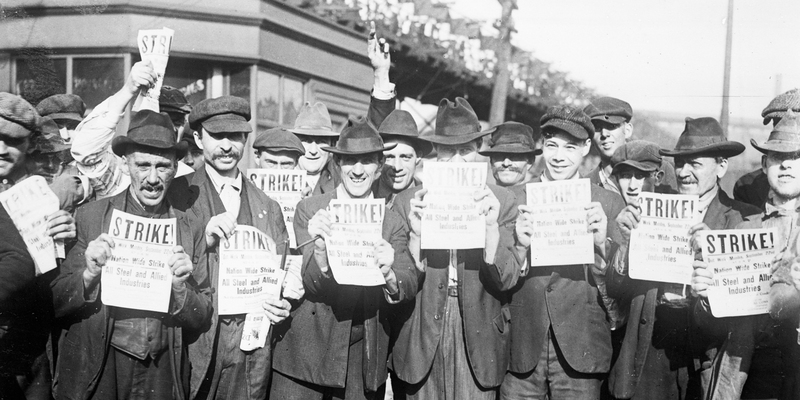 The next day, the workers responded with a general strike which became a full-blown insurrection. The imprisoned sailors were released, sailors raised the red flag over most ships and a workers’ and soldiers’ council was formed to take control of the city. By 8th November, the revolutionary movement had spread across Germany, most notably to Bavaria, where a republic based on workers’, soldiers’ and peasants’ councils had been declared. In Berlin, the revolutionary socialist Spartacist Group and revolutionary shop stewards prepared for a general strike. The reformist SPD sought to find ways to control the situation. Their leader, Friedrich Ebert, commented, “If the Kaiser doesn’t abdicate, the social revolution is unavoidable. But I don’t want it; indeed I hate it like sin.” They sought to appease the revolutionary mood among the working class and soldiers while trying to ensure that the capitalist system remained intact On the 9th November, they declared a republic and Ebert became Chancellor. Ebert called on people to “leave the streets, maintain law and order.” It was in this context that the Kaiser abdicated and Germany signed the armistice. At the same time, revolutionary leader Karl Liebknecht proclaimed to a large crowd a “free, German socialist republic in which there will be no more servants, in which every honest worker will receive an honest wage for his labour. The reign of capitalism, which turned Europe into a swamp of blood, is broken” Rosa Luxemburg warned that the revolution had so far left the real enemy in charge, which was not the monarchy but capitalism. The events of November were not the end of the German Revolution, just the opening shots. In January, German workers would again fight for power in the Spartacist uprising, which was bloodily repressed, including with the murder of Rosa Luxemburg and Karl Liebknecht. Germany was not the only country affected by the Bolshevik bug. In Hungary, a workers’ republic was declared. Mass struggle was the order of the day. 1917 saw a massive mutiny in the French military. The first months of 1919 saw 50 mutinies, something which carried a death sentence. That year saw 35 million working days lost on strike – an average of 100,000 workers on strike each day, including in gigantic clashes between the state and workers in Glasgow. 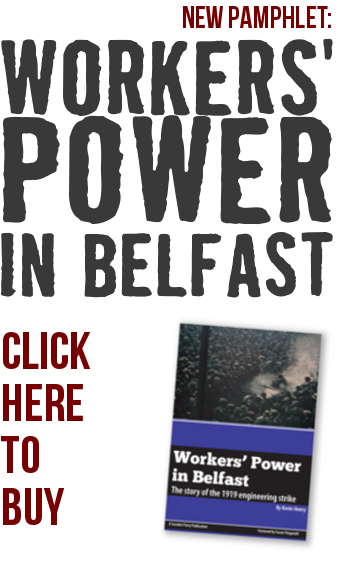 A mass strike developed in Belfast, with workers controlling the city for a month in a fight to shorten the working week. Nor was the revolt confined to Europe. Country after country was in revolt against imperialism. This period saw a massive willingness of workers to struggle and to draw behind them oppressed layers across the world. Only in Russia, however did workers successfully take power. The crucial difference between Russia and Germany was the lack of a consciously built revolutionary party like the Bolsheviks that could lead the working class to power. The Socialist Party does not accept financial support from big business – we rely on donations from ordinary people to support our work. If you would like to hear from us please leave your details below.